On paper, the UK is a terrible place to drive fast cars. Between all the potholes, speed cameras and congestion, there's seemingly no point in driving anything faster than a child's pedal car around the major cities of Britain. But outside of those epicentres lay many miles of winding lanes, rolling hills and flowing country roads just tailor-made for a two-seater sports car and a heavy right foot on the throttle pedal. Fortunately, that's where videogames come in. The Forza Horizon games have always been built around the premise of taking the high-performance cars from the Forza Motorsport series and letting them loose in an open-world toy box, in a manner reminiscent of games like Burnout: Paradise, Need For Speed: Underground and Test Drive Unlimited. From the former two games comes car customisation, street racing and an emphasis on aggressive driving, and from the latter comes a vast map to explore full of exotic locales and a roster of the world's most spectacular vehicles. And having explored America, France, Italy and Australia in the previous three instalments of the franchise, it's time to head to the UK to tear through quaint villages, seaside towns and the city of Edinburgh by way of many miles of country roads and dirt tracks in between. And despite there being no options to stop for a cuppa tea and a scone in the village cafe, the new setting brings a fresh energy and helps Forza Horizon 4 take another big step forward in the franchise. Let's start with the location itself. The feel of the great British countryside is captured in wonderful detail, right down the road signs, the flora and fauna, and yes, the potholes. Though it may feel picture-postcard in its perfection, the in-game world definitely has an authentically British feel to it – an appropriate homecoming for UK-based Playground Games, whose care and attention to detail you can feel all in every mile you drive. The game overall looks absolutely fabulous, with the graphics and lighting picking out every weather and scenic detail. Playing the game through Xbox Live on Windows 10 on my mid-tier PC rig, everything ran rock-solid even in the heaviest rain or snow conditions with no noticeable framerate drops. One slight issue was moderate pop-in at medium and long distance, with AI cars and roadside objects very obviously spawning in and textures sometimes struggling to load in time. Given I was running on low graphical presets, it certainly wasn't a dealbreaker at all, and it should be less of an issue on higher-spec systems and Xbox One X. Overall, it's still a gorgeous experience; not even Top Gear made driving through the English countryside look this good. With the new locale comes a brand new feature of dynamic seasons, with each one affecting weather conditions, gameplay and even map exploration. Leaves blowing across the road in autumn gives way to snowy vistas and frozen lakes in the depths of winter, before the spring breeze freshens the landscape up in time for summer to roll around and players to whip out the convertibles for a blast down the coast. And this all has a marked effect on the gameplay. Wet and snowy roads mean mega-powerful hypercars are a real challenge to drive especially on simulation physics, and each season lends itself to cars of different types. Even in the dry, crests and bumps in the road can easily unsettle cars at high speed, causing the player to skid off the road and through a field sideways as herds of sheep scatter asunder. Pro tip; lll-wheel drive cars like the Ford Focus RS, Subaru Impreza or Nissan GTR are your friend, and like most British farmers, keep a Land Rover or equivalent 4X4 vehicle in the garage for when you fancy exploring the high peaks in the depths of winter. Happily, there's a vast array of cars for whatever driving experience takes your fancy; 450+ cars from over 100 manufacturers adds up to the most varied roster in any Forza Horizon to date. The campaign mode returns with some slight alterations from Forza Horizon 3. Regular races, dirt/rally events and street races unsanctioned by the main Horizon Festival form the backbone, and are augmented by other events such as a movie stuntman side-quest and Showcase events. The latter takes the form of crossover races, such as Car Versus Hovercraft, Car Versus Dirtbike Gang, and my personal favourite; Car Vs Flying Scotsman Steam Train. Additionally, Barn Finds return from previous Forza games, a custom Route Creator tool is new for this iteration, and buyable properties (including Edinburgh Castle!) unlock perks when purchased and serve a worthwhile purpose alongside everything else. All of this means the single-player has plenty to do without ever feeling like a grind, and the absence of loot boxes is very much welcome. However, it's worth noting that unlocking Horizon Life and the online multiplayer modes requires a solid 4-5 hours of gameplay, which in turn could make ploughing through the various events earning 'Influence' feel like a chore if that is what you're in this for. 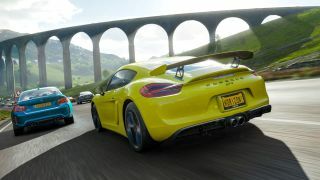 Fortunately, said multiplayer modes are good fun when they open up, with point-to-point races and Capture-The-Flag style arena battles amongst fellow members of your Convoy all running on stable connections and matchmaking. This mix of game modes also encourages different car choices and play styles – that Subaru Impreza I mentioned earlier will be invaluable for the many rally events, and that Land Rover will be very handy when you hear about a possible barn find hidden halfway up a mountain. Let me make this very simple for you; Forza Horizon 4 is really good fun. Like the previous Horizon games, it's a toy box full of exotic cars, roads to drive them on at high speed, banging tunes to blast out, and scenery to crash into and ramp over. Like any good open-world game, it rewards exploration and offers both a structured campaign mode and plenty of distractions around the campaign. And the new setting feels like something of a love letter from Playground Games to rural Britain; charming, idyllic and made for cross-country road trips.